“The high density of the individual is to serve rather than to rule.” Albert Einstein At 86 years of age, Rebecca P. Eden, RN, BSN and WW II United States Army Nurse Corps Veteran, still resembles the rosy-cheeked face of the young woman in the 8 x 10 photographs that rest in her lap. In each picture, a proud and determined woman stares back with a subtle compassionate smile. When she enlisted in the Army in 1944, she was unaware that she would be honored by being inducted into the 2008 class of the Ohio War Veterans Hall of Fame. When General George Patton Jr., Commander of the US Third Army in World War II, said, “Wars may be fought with weapons, but they are won by men,” perhaps he should have given thought to the crucial role of the women who served, especially the nurses who cared for the wounded soldiers. Rebecca still remembers her patients; soldiers whose lives would be changed forever due to their wounds or traumatic shock from battle, with scars to verify that their nightmares were real. Rebecca remarks that war is different now then it was then, and she questions whether she would have been able to have the same impact in this generation’s wars. But her children, who nominated her for this honor, are aware of her strengths and abilities, and know that she has always risen to challenges she has faced while helping others along the way. This month, Rebecca will be honored for her military service to her country and her ongoing service to her community when she is inducted into the Ohio Veteran’s Hall of Fame in Columbus. The event begins with an evening reception on November 6th. On Friday, November 7th, Rebecca will participate in the Veterans Day parade in Columbus, and the formal induction ceremony will be held that afternoon with Gov. Ted Strickland presiding over the ceremony. Rebecca knew as a young child that she wanted to work in the medical field. As a survivor of typhoid fever when she was six years old, Rebecca remembers the compassion that the nurses and doctors showed her. Because women were rarely accepted to medical school in the 1940’s, Rebecca set her sights on nursing. She graduated from St. Lukes School of Nursing with a Diploma in Nursing, and shortly thereafter enlisted in the Army Nurse Corps. She served two years of active duty at Camp Atterbury, and received an honorable discharge. Taking advantage of the GI bill, Rebecca attended Frances Payne Bolton School of Nursing (Western Reserve University) and earned a BSN in Nursing Education. Upon graduation, she taught at St John’s Hospital School of Nursing. In 1949 she married Michael J. Eden and began to raise her family. After her husband’s death in 1959, Rebecca returned to the workforce and began teaching at Jane Addams School of Practical Nursing. Her life’s work included helping guide approximately 3500 students to earn a diploma in Practical Nursing and become Licensed Practical Nurses. She later became the Director of the Jane Addams School of Practical Nursing and is well known for encouraging and supporting inner-city women to enhance their education and develop a “sale-able” skill. In addition, Rebecca was instrumental in getting her Practical Nursing School accredited so students would be eligible for federal financial aid and grants; she also served as the Financial Aid Director for her school. Rebecca worked in Nursing Education for three decades. Throughout her career, she served ten years on the Ohio State Board of Nursing and became Ohio’s “top nurse” as the President of the Board of Nursing for two one-year terms. In 1982, Rebecca received the Veterans Affairs Commendation given by the Ohio Veterans Commission for helping veterans pursue educational goals, and she received the Woman of the Year Award from the Cleveland Area Citizens League for Nursing in 1984. 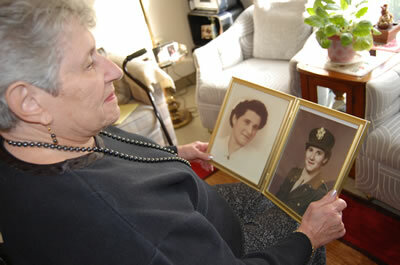 Rebecca is a lifetime member of the Gold Star Wives, and the AMVETS. She broke gender barriers when she became the first female member of an all male Jewish War Veterans Post. Facing gender discrimination of the times, Rebecca turned her efforts to the Jewish War Veterans Ladies Auxiliary where she was a 31-year member serving in many offices including its State President. Rebecca continues to be an active member of the community holding memberships in many diverse organizations. Rebecca moved to Wiggins Place in 2005 and is currently completing her second term as president of the Tenants Association. Drawing on her leadership skills, Rebecca is responsible for writing the bylaws that govern the Tenant’s Association; she also helps in their fund-raising activities. Rebecca is the proud mother of Dr. Samuel Eden (d. 2004), David Eden, Sherry Eden Rosenfeld and Dr. Diane Eden. She also has ten grandchildren and three great-grandchildren (with a fourth one expected in December). Since her retirement, Rebecca and her twin sister Lillian Mulberg continued to enhance their lives by traveling the world including seeing the United States, and visiting Central and South America, Europe, Russia, Asia, Australia and New Zealand. As Albert Einstein once said, “Peace cannot be kept by force; it can only be achieved by understanding. “Rebecca has offered peace to hundreds of people through her nurturing and the giving of her compassion, leadership, time and energy.